After four months of construction, Lot V reopened today for parking by students, faculty and staff. For some time now, passers-by have been noticing the covered structures going up in Lot V, wedged between the Save Mart Center and the Joyal Administration building. These structures are among the new innovations that set this parking lot apart. 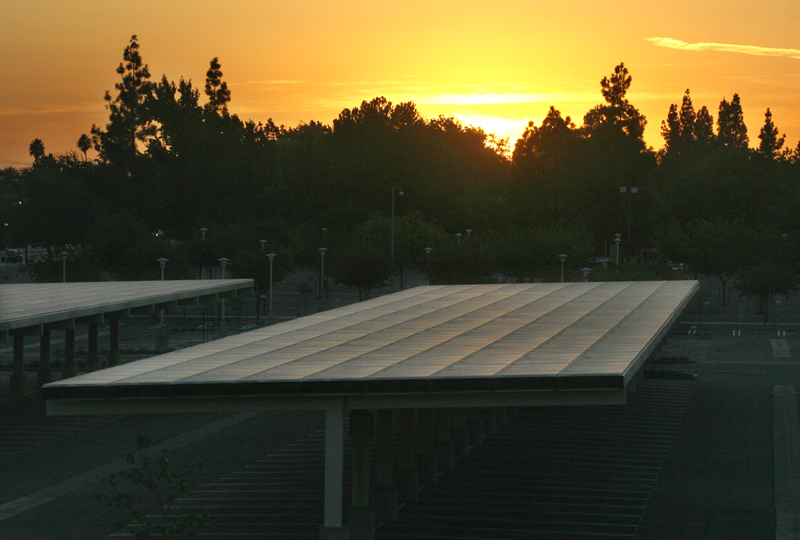 The parking structures make up the largest photovoltaic project of its kind on any university campus in the United States. This means that the solar panels installed on the structure roofs â€” 3,936 in all â€” are there for the purpose of generating electricity, and are projected to provide for 20 percent of the universityâ€™s energy. The solar panels will convert the sun’s energy into 1 megawatt of electricity, which then goes into the campus power grid. The project is in partnership with Chevron Energy Solution. The other innovation is the creation of a premium reserved parking program on campus. Premium reserved parking will allow faculty and staff unlimited access to assigned stalls, for a special permit tag cost of $50 per month. Currently, faculty-staff parking permits cost $9-$15 per month. Administrative project coordinator Tom Gaffery said premium reserved parking is an entirely new category for the campus. He said Lot V will serve as the only place for such parking for the time being, but other locations may be considered in the future. The newly renovated Lot V now holds 717 parking stalls for student and general parking, 43 stalls for 10-hour metered parking, and about 190 premium reserved stalls in the three northern-most covered structures. Campus Police Public Information Officer Amy Armstrong said the new Lot V now contains more parking spaces than the old one. The 717 stalls is the same number of spots available from before, but the other approximately 235 stalls have been added on. A grand opening ceremony for Lot V is planned but has not been announced yet, Armstrong said. Today and for the next week or so, traffic control officers will direct motorists to available parking stalls, Armstrong said. â€œWe donâ€™t want students to be confused and park in the reserved parking,â€ Armstrong said. The $7.4 million project was initially funded with a $2.8 million grant. The balance will be payed back through PG&E cost savings.